West Brom will hold talks with striker Saido Berahino after Tottenham's failed deadline-day bid to sign him. But the England Under-21 international, 22, will be fined for comments he made on Twitter that appeared to criticise Jeremy Peace. The Baggies chairman turned down two late bids for Berahino and criticised Spurs for trying to get him "cheaply". 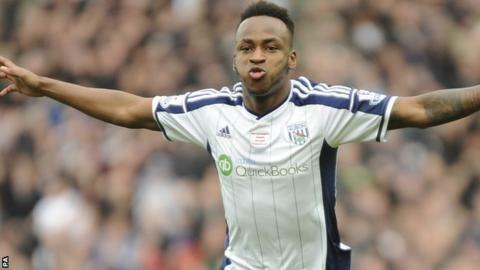 Berahino will meet with West Brom manager Tony Pulis and other key club officials on Monday. The forward was due to return to training on Friday but has been given extra time off. Gordon Taylor, chief executive of the Professional Footballers' Association, says the players' union has been in touch with West Brom and Berahino's representatives and expects them to resolve their differences. Spurs had two other bids for Berahino rejected in the summer. The player also had a transfer request turned down and made his dismay public when it became clear he would not be moving to White Hart Lane. In a tweet, he appeared to suggest he would not play for the Baggies under Peace's chairmanship. Peace has made it clear he feels Spurs are to blame in the matter, claiming he had spoken to Tottenham chairman Daniel Levy earlier in the summer to explain his club's stance. "We have a key player who has been very unsettled by antics which were designed to get him out of our club cheaply," said Peace in a statement on the club's website on Tuesday. West Brom also said Tottenham's offer for Berahino was not enough - either the amount they had offered as an initial down-payment or the final total of £22.5m spread over five years. Levy later issued a transfer dealings statement on Spurs' official website which appeared to explain the club's dealings over Berahino. "We have never, as a club, spoken about another team's players and I am not about to do so now," it read. But it continued: "There is hardly a transfer concluded across Europe which doesn't include staged payments. This is particularly so when significant amounts such as £20m-£30m are involved - players don't come cheaply these days. "Secondly, we do not make anything personal. None of the proposals, discussions or negotiations we undertake involve any personal elements or ego - everything we do is in the interest of what is best for our club. "Thirdly, we never make anything public, particularly in the best interests of the players involved. Making aspects such as transfer requests public is wholly disrespectful to a player." Former West Brom striker Jason Roberts says he has some sympathy for Berahino. "Whatever the communication has been with Berahino, he has thought the transfer will go through," Roberts told BBC World Service. "It was an amazing reaction to go out publicly to say you will not play for the chairman again - that is a big call from the player. "I feel some sympathy for Saido as he is in the middle of this but at the same time, it may be a misjudgement to come out and say he won't play for the chairman again." BBC Sport spoke to Mishcon de Reya's James King about the Berahino saga and the potential fallout of strike action by the player. "Berahino won't face the inevitable disciplinary process until Monday when he'll meet leading executives at the club to discuss his expected fine and to see how they can get such a discontented player back onside. "West Brom's postponement of the meeting is designed to draw some of the sting from the media's focus on this spectacular fall-out between Peace and Berahino. "But Peace's relationship with the player is nowhere near the as crucial as the role Pulis will play in his reintegration. "I understand Pulis was resigned to losing such a valuable but disillusioned player, but now he somehow has to talk Berahino round." West Brom Supporters' Club chairman John Homer believes the club and player need to "take a step back" now and move forward - but it may need Berahino to "show contrition and apologise to the Albion fans". He told BBC Radio 5 live: "It's always upsetting when a player comes out and says he doesn't want to play for the club and wants away, so that will alienate him with some supporters. "Football supporters are fickle though and if in a fortnight's time if he were to play against Aston Villa at Villa Park and get the winning goal, we'd have a different viewpoint on the lad." And referring to the Burundi-born players rise through the ranks and to the fringes of the England national team, he added: "It's a tremendous story and for it to go foul at this stage of his career is desperately sad. It's doing nothing but damaging his prospects." PFA boss Gordon Taylor told BBC Sport: "Every difficult situation can be resolved. We get called in on a number of occasions where there are disputes between the players and the club and we're more than happy to try and help resolve this one. "With social media, the players are young lads and we expect them to have old heads on young shoulders. "I can't recommend any player refusing to play and I hope with the experienced management at the club the situation will be resolved. I would be surprised and disappointed if it wasn't. "If he chooses not to play it will be difficult to get another club as he will lose his fitness and his form. He's clearly a very talented player with a big future." For a recap of transfer deadline day, click here.